Damages caused during the violent protest by students of the Kwame Nkrumah University of Science and Technology (KNUST), is estimated at 1.6 million Ghana cedis. This is according to authorities of the school, who also indicated that the cost excludes items that were stolen during the violent protest. The revelation comes on the back of a visit to the school today [Wednesday], by the Chancellor of the University, Asantehene Otumfuo Osei Tutu II. 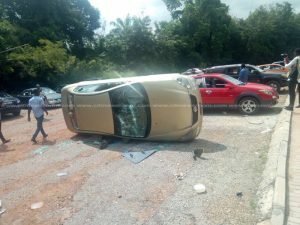 Speaking to Citi News, the University Relations Officer, Kwame Yeboah, said it is still unclear who will bear the cost of the damages until investigations into the incident are completed. The Chancellor of the Kwame Nkrumah University of Science and Technology, Otumfuo Osei Tutu II, paid a visit to the school today [Wednesday] to assess the damage caused, after the violent student protests. Rampaging students destroyed over 40 staff cars and also vandalized school properties. The Asantehene has already stepped in to have lecturers call off their strike in protest of the dissolution of the school’s governing council. The government asked the Asantehene to take steps to reconstitute a new Governing Council in accordance with the institution’s relevant statutes and laws. The new council is expected to be constituted on Friday along with the reinstatement of the Vice Chancellor, Professor Kwasi Obiri Danso, who asked to step aside on Monday. The government constituted an interim council after it closed down KNUST over the violent protest. It gave the council a 3-month tenure to work towards addressing the impasse between students and the university management, while making sure the University reopens before November 8, 2018. There was however opposition to the developments, as members of the Senior Staff Association, the Ghana Association of University Administrators (GAUA), the University Teachers Association of Ghana (UTAG), and the Teachers and Education Workers Union (TEWU) staged a demonstration against the dissolution of the University’s Governing Council. This forced government to make a U-turn, giving the Asantehene much of the task to deal with the impasse. The post Damage from KNUST violent protest estimated at Ghc1.6 m appeared first on Citi Newsroom.